Wall, NJ: The new Pharmafill BCV1 Bottomless Conveyor from packaging machinery manufacturer Deitz Co., Wall, NJ (www.Deitzco.com), enables serial numbers, lot codes and other markings to be easily printed on the bottoms of plastic and glass bottles without requiring the bottles to be slowed, stopped, rotated, diverted or otherwise disrupted from their flow in the packaging line. 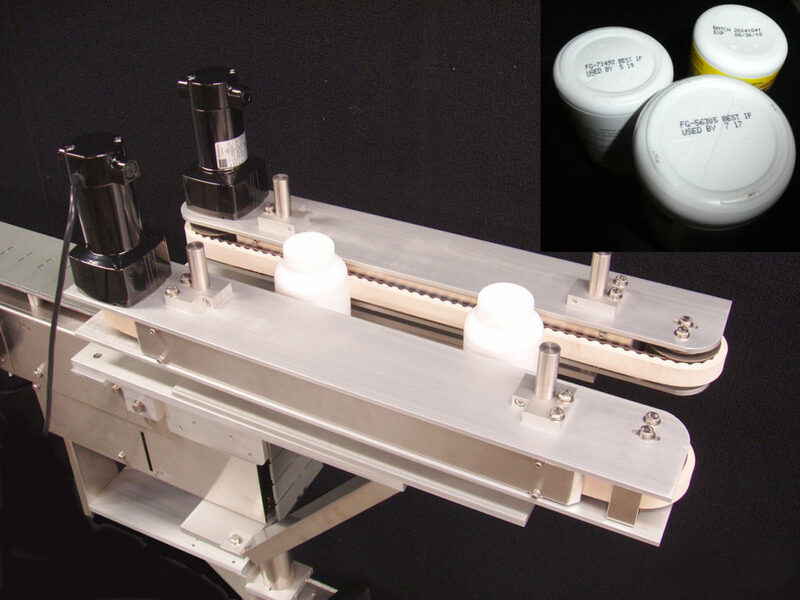 Ideal for nutritional supplement bottles, pharmaceuticals and other products where identification and/or traceability are required or desired, the clever BCV1 Bottomless Conveyor accepts containers from a standard conveyor that drops out from under the bottles as dual side belts gently grip and convey the bottles over a laser marking device, thermal inkjet printer, continuous inkjet printer or other coding system. When marked, the BCV1 Bottomless Conveyor releases the bottle to the next stage in the packaging line. To be unveiled at the Deitz Pack Expo booth #S-1415 on Nov. 6, 2016 in Chicago, IL, the Bottomless Conveyor technology also may serve as an active transfer mechanism to transfer bottles and other containers from one point to another instead of using dead plates or other passive diverters, which require back pressure from the containers. The BCV1 hugger belt conveyor may be easily adjusted in width and in height to accommodate a wide variety of bottle shapes and sizes and may be mounted on a conveyor or set on a sturdy, adjustable-height lift stand. The BCV1 Bottomless Conveyor is manufactured in the company’s Wall, New Jersey, headquarters, and ships fully tested and assembled.